‘Temple Treye’ is an ascetic yet vigorous continuation to the groups past discography. An outlandish touch ignites the earth-bound stellar components into bi-directional currents. Abstract electro-acoustic currents, coarse drone ambience and meditative rhythms guide onward on the pathway eating itself. Telemorphic-statues are burning, spectral-horizons collapsing into sub-atomic states which linger omnipresent among the threads of blooming semblances. Prism-like petals wither into immaterial gorges of power. Guardian’s tonguing stare churning the revealing paralogies. Trance feasting the entrance. This is archaic dronumental Temple Music in its purest form. Total time: 43:41. Temple Treye is available in two editions; regular Sublunar edition of 444 copies and a deluxe box set edition of 49 copies. 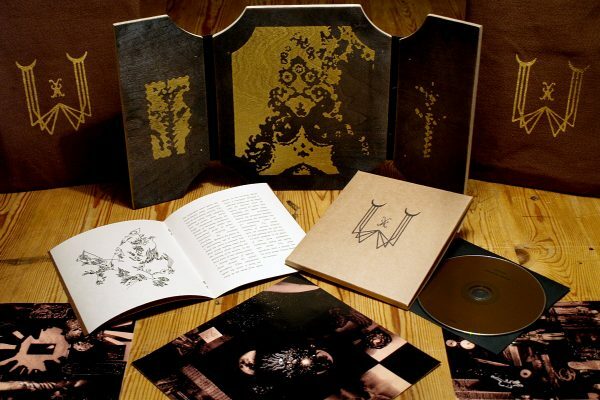 The regular edition of the album is housed inside a hand finished cardboard covers including an eight panel booklet. The deluxe box set comes in a silk-screen printed canvas pouch and includes the regular CD edition, three large collage artwork inserts and a handcrafted Tricuspid Treye-skladen.